The drive down to the United States from Canada was fine and fast, with no hassles at the border. 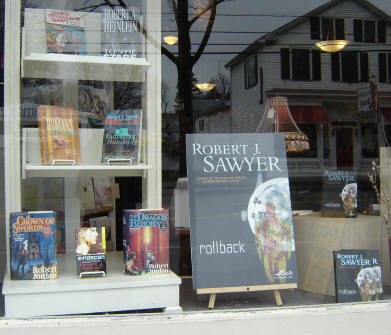 And the U.S. launch party for Rollback at Write Book and Gift in Honeoye Falls, New York, went really well -- in some ways better than yesterday's Bakka-Phoenix event. The store is co-owned by Hugo finalist Nick DiChario, whose novel A Small and Remarkable Life I published under the Robert J. Sawyer Books imprint I edit for Fitzhenry & Whiteside. The store is two storeys tall, and the upper floor is used as a function space. Nick and co-owner Dan Plumeau had set that space up for today with rows of chairs, and a nice raised stage for me. It was more comfortable for everyone than the standing-room only event at Bakka, and beside my reading I was able to do a lengthy and lively Q&A. We had 60 or more people show up -- which is great for a store in the middle of nowhere when the weather is crappy. I was particularly touched that some friends who had to travel a considerable distance came: Dr. Richard Wilber, from Lewiston, NY; Chuck McGraw and Mark Garland from Syracuse, NY; and Dr. David DeGraff from Alfred, NY (David was an astronomy consultant for Rollback, and he teaches my Mindscan in his "Science in Science Fiction Course" at Alfred University). Nick's parents and aunt took care of providing refreshments (including wonderful, home-baked cookies). After the signing, a bunch of us (including all those named above) headed out to The Brewery, Honeoye's pub. Astonishingly, despite a big, unruly group that showed up unannounced, the server got every single order correct. Also astonishing, for such a large group, was that when everyone threw in their money at the end to cover their portion of the bill, we ended up hitting the total (which had had 15% gratuity added on for the large group) exactly the first time out. And what was on the pub's TV but the this week's digitally remastered episode of classic Star Trek; for a number of people in our group, it was their first time seeing any of the new CGI effects (sadly, though, the episode was the awful "And the Children Shall Lead"). All in all, a wonderful event -- and Wayne Brown recorded the whole thing for the Rochester cable-access SF program Reality Fast Forward. Carolyn and I spent the evening in Brockport, NY, at the home of Marcos Donnelly and his wife, Vikki. Marcos's Letters from the Flesh was the very first book published under my Robert J. Sawyer Books imprint. 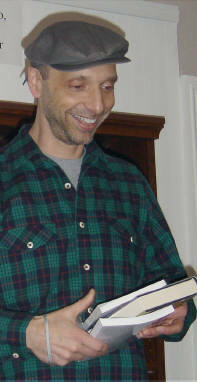 At their house, I did a phone interview with a reporter for FFWD ("Fast Forward"), the weekly arts paper in Calgary, Alberta, to promote my reading there on Wednesday, May 2, 2007. 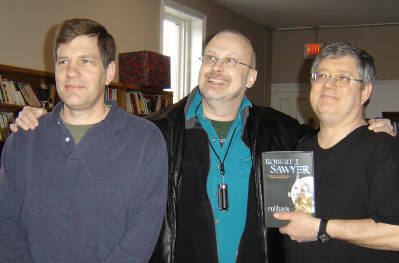 And during the day, I recorded separate interviews with Nick and Marcos, which will be turned into podcasts for the Robert J. Sawyer Books website. In your photos you appear to have a digital voice recorder around your neck. I know why you might use one - what model is that and are you happy with it? Am I correct to presume that you're recording stereo for the upcoming podcasts? It's an iRiver 790. I like it, and bought it on the recommendation of podcasters Tee Morris and Evo Terra.